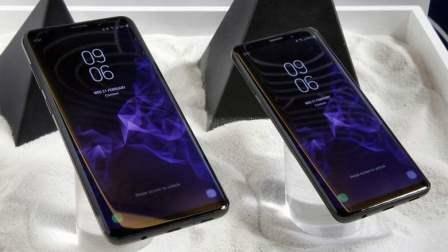 Samsung Electronics finally unveiled its much-anticipated Galaxy S9 and S9+ smartphones, making good on the hype it generated - plus also putting out a direct challenge to one feature pioneered by its biggest rival. DJ Koh, president and head of Samsung's IT and mobile communications division, kicked off the event preluding the Mobile World Congress in Barcelona on Sunday, by saying that it's users - not companies - that drive change. "I believe we overestimate our impact. it's not the tech companies that change the world - it's people," he said. "It's you," he told the audience, that opens the doors to new experiences. and there's no better proof than the mobile phone; it started out as a simple device, and you wondered what was possible." The Galaxy S9 and S9+, while similar in form to its predecessors, last year's S8 and S8+, come with more advanced cameras. Jason Denison, Senior Vice-President for product marketing, said that Samsung placed technology in the cameras akin to the human eye. "We turned to an incredibly powerful imaging tool: the human eye," he said. The cameras on the S9 devices have an even lower aperture of f/1.5, meaning it can take better shots in low-light situations. The S9+, which comes with a dual-lens system, has dual-aperture and optical image stabilisation. But perhaps the most interesting feature of the devices' cameras is AR Emoji, Samsung's answer to Apple's Animoji, which it featured in its 10th-anniversary iPhone X.
AR Emoji, just like Animoji, captures facial gestures and mimics them into emojis. But this time, users can customise it, from its hair to outfits. Its main advantage is that it can be sent across any smartphone and can be used on third-party apps, like WhatsApp. The cameras also feature slow-motion video of 960fps. Bixby, Samsung's digital voice assistant, is also more intelligent. It can translate certain languages quickly, while also helping shoppers even more. The popular Infinity Display has also been stretched out further, giving an almost edge-to-edge experience. The smartphones also now have speakers on top and below. The Galaxy S9 and S9+ will retail for $720 (Dh2,644) and $820 (Dh3,085) - not as high as initially feared and staying well below the iPhone X's price points. It will be available starting March 16 and pre-orders, in a latest update, are already ongoing in certain territories.